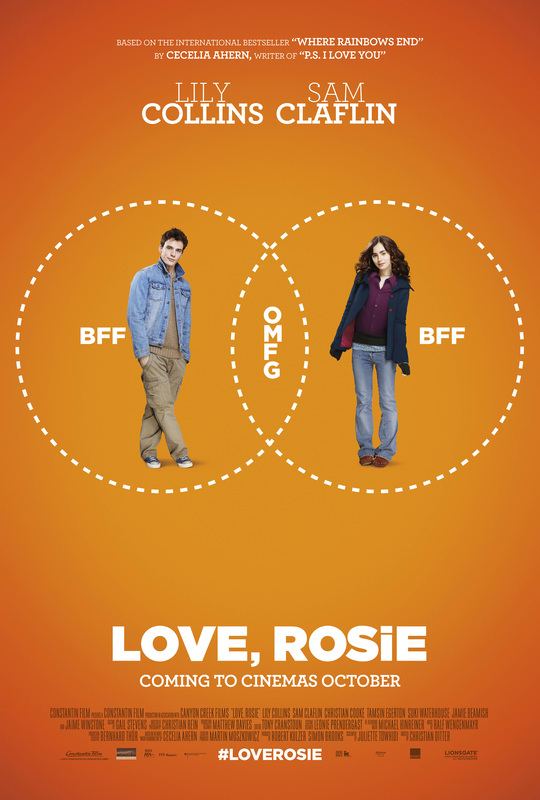 “Love, Rosie” feels a lot like deja-vu, but it’s sweet, charming and entertaining. I’m sure you’ve seen a lot of romantic comedies that cover a long time period in a constantly-changing relationship. From the peak of “When Harry Met Sally” to the low of “A Lot Like Love”, we’ve seen it all. So basically the outcome of the story here, about a man and woman who have been friends for a long time but never actually dated, is obvious from the get-go, so this film is all about the journey, not the destination. That journey is brightened by a charming cast and a surprisingly sassy, funny screenplay by Juliette Towhidi, from a novel by Cecelia Ahern. The fact that Lily Collins and Sam Claflin make a good team is the main reason this otherwise predictable story seems enjoyable. Both actors bring conviction to their roles, and even though the story isn’t daring or highly original, it offers its stars a vehicle that calls on both their comedic and dramatic chops. As someone who doesn’t mind a cute romantic movie from time to time and welcomes a change from deep, thought provoking films, I had a good time with “Love, Rosie”.